Cats and dogs add endless joy to our lives. They’re cute, cuddly, and unconditionally love us. However, pets also scratch, claw, break, and chew things. They can do their fair share of damage to the home if not properly trained (or if they just feel like it). Window treatments are tempting and present a prime opportunity for pets to get into mischief. After all, they’re just hanging there, asking to be swatted, tangled, and chewed on. Avoid the mess and safety hazard by choosing window treatments that can stand up to your furry friends. While dogs and cats may still claw and scrape at the blinds if they can reach them, cordless blinds take the cords out of the picture, so animals won’t get caught up in them. Ditch the cords and choose cordless shades or faux wood blinds that you easily open and close by pulling them up and down. Faux wood blinds are more durable than aluminum blinds, which means they’re less susceptible to clawing and scratching. They’re less expensive than wood blinds but look just as sophisticated. If one cracks or bends, you can easily order a replacement without breaking the bank. Unlike wood blinds, faux wood blinds are moisture-resistant. They can get wet and can be tugged at without falling apart. Also, the color on faux wood blinds is consistent throughout the slat, so if they get scratched, it’s less obvious. When they’re open, wide slat blinds let in more light than your average blinds and your cat or dog can see out of them more easily. They won’t be scratching at the blinds just to get more sunshine to nap in or to look for critters in the yard. The areas in front of sliding doors and porch doors are the ultimate lounging spots for pets. Outfit these doors with vertical blinds with wand control. 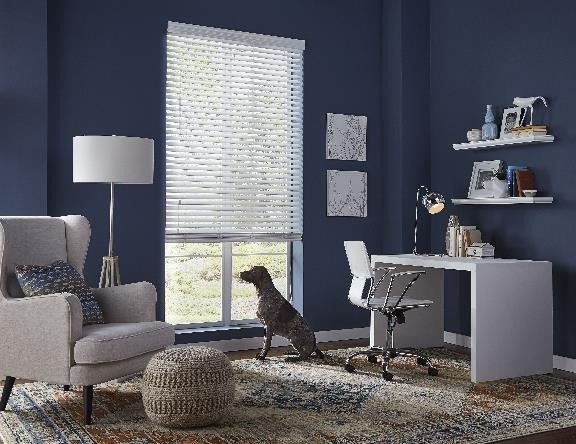 You can easily push vertical blinds to the side so your pet can hang out without being tempted to damage them. It also takes only a few minutes to replace one of the louvers if it comes dislodged. Plantation shutters, which are typically made of wood and faux wood, are sturdier than blinds. Before you leave for the day, open them and let in the light. Your pet can sit by the window and look outside until you get home. However, keep in mind that wooden plantation shutters may not be the best choice if you have a new puppy or if your cat likes to scratch at wood. Motorized shades can be controlled with the touch of a remote or on your phone if they’re the smart kind. With the click of a button, you can roll them up. The need for cords is eliminated, reducing the temptation for pets. Blinds can make your home more comfortable, help you save on energy costs, and complement your home’s decor. Make sure you choose a style that works for every member of your family, including the four-legged variety. Katie Laird is the Director of Social Marketing for Blinds.com and a passionate home decorator for her family with a love of all things Mid-Century Modern and blue. Blinds.com carries a variety of faux wood blinds and other pet friendly window treatments on the website.